If you’re reading this, you’re there’s a very good chance you’re like me and you have a hard time concentrating, studying, or sleeping because of outside noise. Using a fan for white noise can make a big difference! However, shopping for the best box fans for white noise can take hours. To help, I’ve put together a list of 4 of the best box fans for white noise along with reviews and pros and cons. You’ll also find helpful info about white noise and how to get the most out of your box fan. 4. Which way do you put a fan in the window? 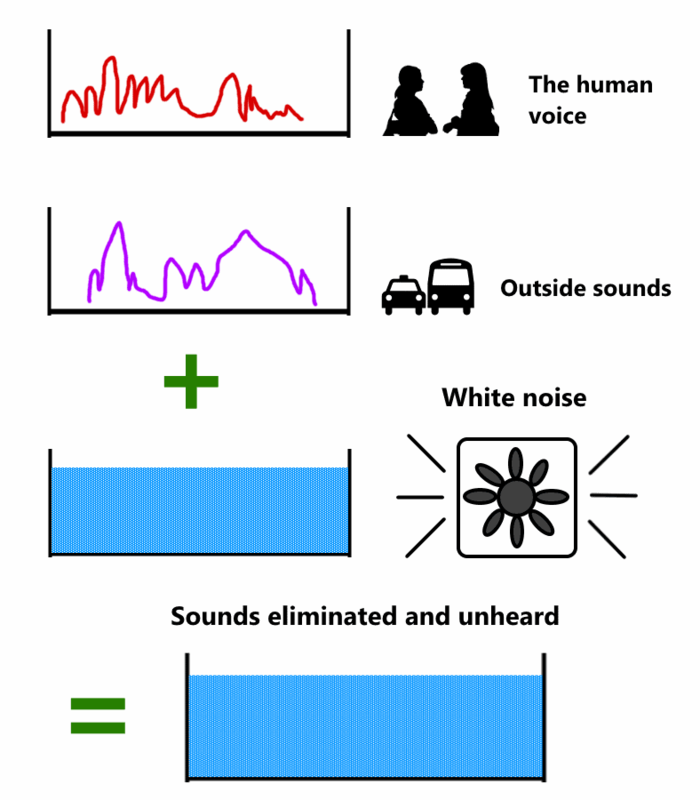 Graph showing white noise and how it works in terms of sound. The term “white noise” describes a sound source that produces audio noise throughout the entire range of human hearing. This is very important as I’ll explain later. White noise is an interesting topic! Of course, we’re most concerned about how it can give us relief for lots of problems caused by distracting outside sounds. Technically speaking, white noise is a range of noise audio that covers the full range of sound frequencies your ears can hear. It is used to mask – or cover up and block – bothersome sounds. Many of the sounds you hear everyday and that would distract you occur in a few portions of the range of human hearing. White noise is very different from music because it’s intended to cover the entire audio range of human hearing (about 20 Hertz to 20 Kilohertz). By contrast, music for example only has portions of sound from a singer, synthesizers, and so on that occur in a few areas of the range your ears can hear. People respond well naturally to soothing sounds like it and other sources of pleasing audio, so it can also help you relax and enter a lower-stress and more focused state, too. 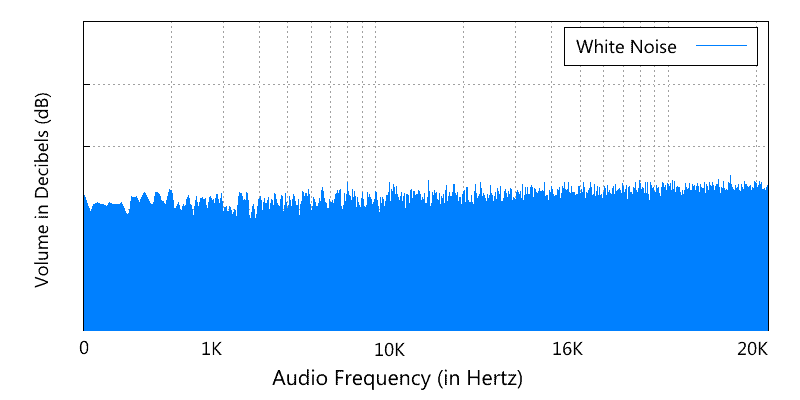 Where is white noise used? It’s often used in places like baby nurseries, hotel rooms, therapy offices, and of course bedrooms. People who have difficulty sleeping while travelling (like me) often carry a small white noise machine to help. Just about anywhere you need relief from distractions white noise is extremely helpful. Box sounds produce white noise that works to block out bothersome sounds by what’s called masking. This simply means they cover up audio that is equal to or below the volume of the noise generated by a box fan. When sounds are covered up sufficiently, your brain doesn’t process them or spend any time being distracted by them. They’re effectively eliminated that way. The noise produced by a box fan doesn’t actually remove sounds that bother you – they help by a process called masking. That simply means the noise a fan produces covers up – or “masks” – those distracting outside sounds. However, to our brain, it’s as if they don’t even exist at all. Box fans effectively eliminate troublesome sources of sound by keeping our brain from being able to detect and react to them. The human brain can’t pick out separate noises when there are many mixed together. There’s simply too much information to process, and when sounds become combined together they can’t be separated. For example, try listening to 2 or 3 music sources at once. After a certain point, it’s impossible to pick apart the individual instruments and so on. That principal is how masking works. Since your brain will never hear them (as long as they’re not louder than the white noise) it’s like they don’t exist! 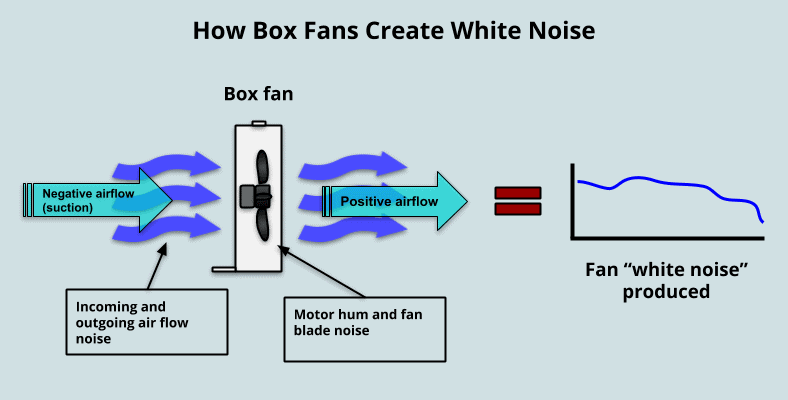 Note: Technically speaking, box fans actually don’t produce white noise but produce “brown noise.” People tend to use the term “white noise” interchangeably with brown noise which is similar but different in how the upper range of frequencies is produced. However, that’s just a trivial detail to know. Box fans create noise from a combination of sources that result in a soothing and calming noise. The movement of air from the input (suction) side of the fan, the fan motor itself, the air disturbances at the blades, and the air blowing from the front side combine to mask outside distractions. Box fans are accidentally good producers of white noise. I say that because they’re not designed to do so…it’s a by-product of how they work. To our ears this appears as a mixed “white noise” effect that’s rhythmic, calming, and helpful for blocking many of the sources of sound that make studying, relaxing, sleeping, and life in general much harder. Because of their design, they tend to vibrate a bit which also lends itself to affect their sound output as well. The alternating current (AC) motor of a fan often produces a gentle hum reflective of its 60 Hertz power source (or 50 Hertz for some countries outside the USA). Which way do you put a fan in the window? There isn’t really a “best” way to place a box fan in a window. This is due to the physics of gas (air) movement. A fan in a window creates air pressure (fresh air moving in) which is offset by an equal and opposite air pressure (old air moving out). To get a room filled with fresh air more quickly, however, it’s best to have at least 1 more window open. That allows air to circulate more rapidly and more efficiently. For the most part, it doesn’t matter a lot which way you place a box fan in a window. However, there are a few ways to use it depending on what you need. That’s because of the laws of physics involved: air flow in = air flow out. In other words, the air movement a fan brings in will be equal to the air leaving. 1. If you have only 1 window in a room, I recommend you place the fan facing in. 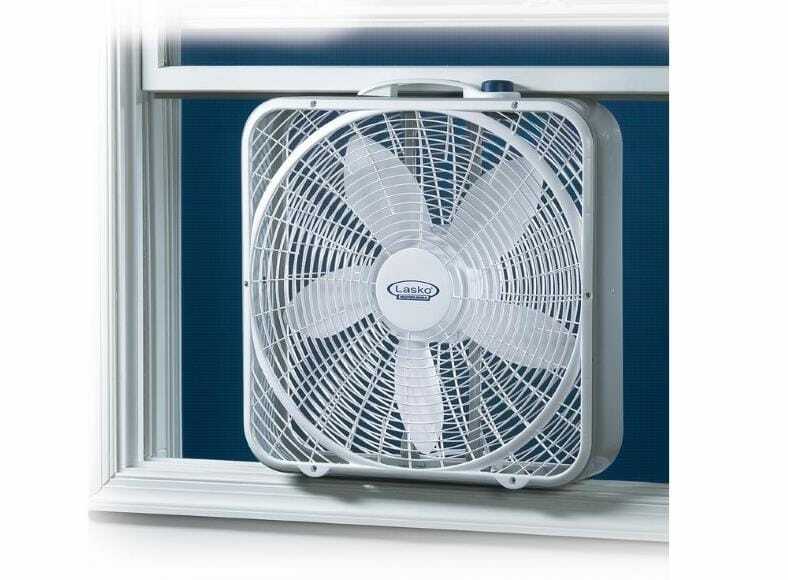 This allows the fan to force air into the room and push back against the window. In some situations it will help keep the fan upright. You’ll still have air circulate. However, it will take much longer than having another window open as the window opening size will be more limited (air circulation will be restricted and the old air won’t be able to escape as easily). 2. If you have 2 or more windows, leave at least 1 open for maximum cooling and air circulation. With at least one additional window open you can have great air flow and cooling within a room. That’s because a room with only one window open (and with the fan placed in the same window) is forcing air against more pressure as the air can’t flow easily back outside. 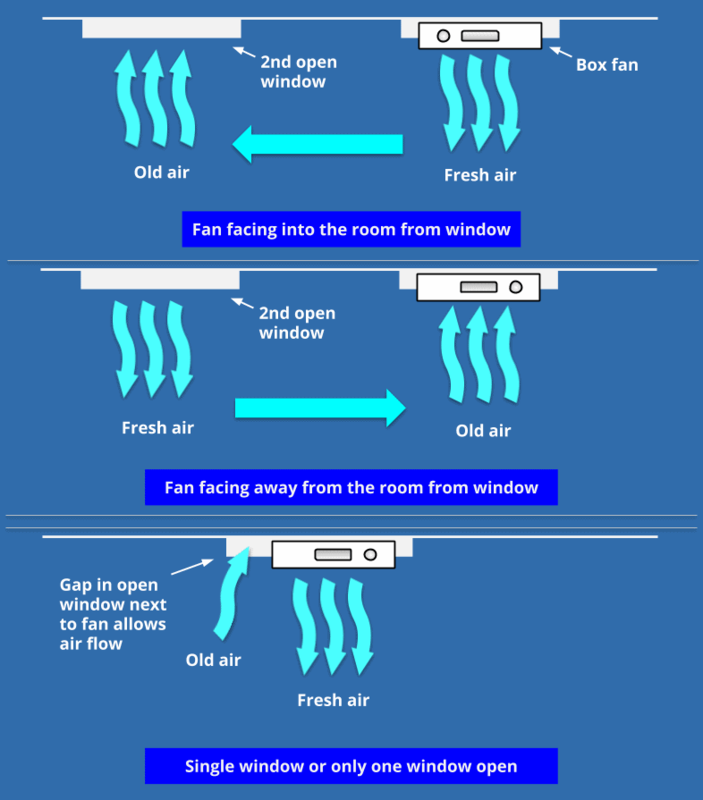 When a second or third window is open the resistance to the fan’s air pressure is removed and air can escape easily at the same rate it came in. 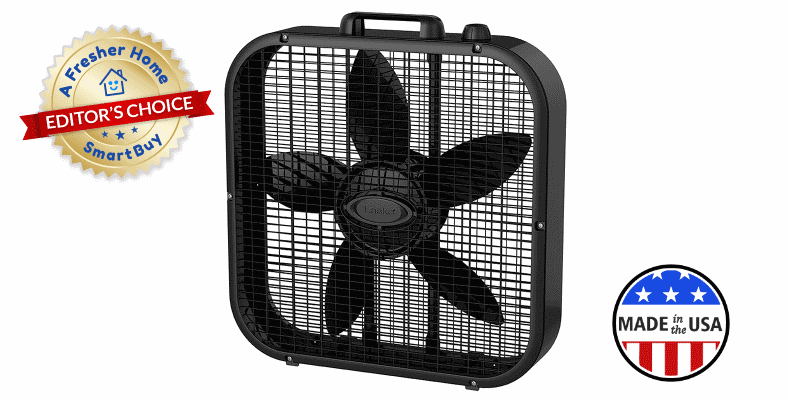 Box fans sometimes produce more noise on the output side due to the fan blades facing forward. It’s a relatively minor difference but in my experience one that works best. American-made and a great value. Great white noise fan! 1. 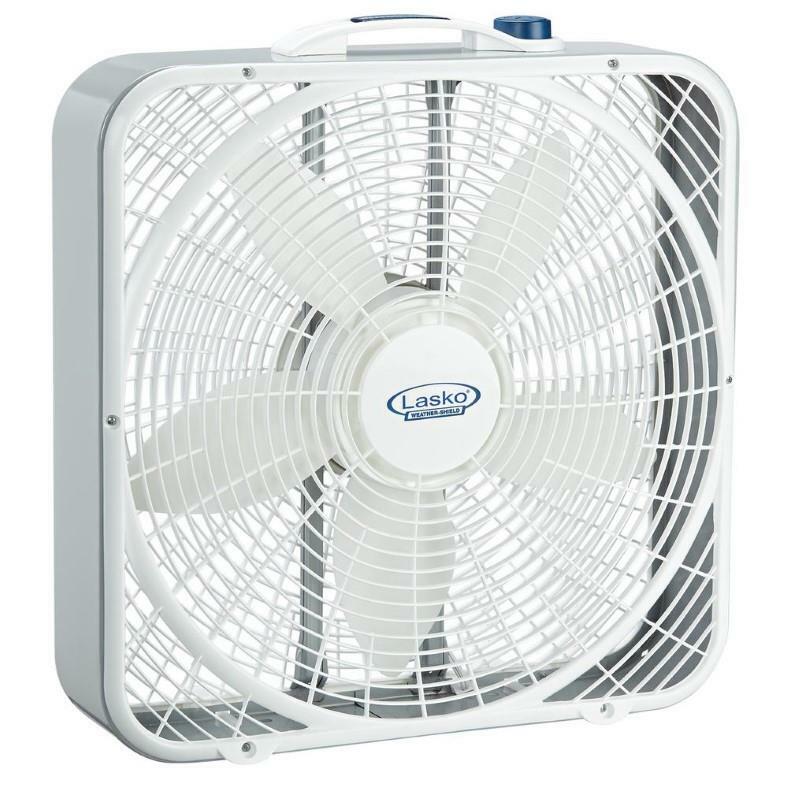 Lasko B20401 Decor Box Fan – Well made, energy efficient, and excellent for white noise. An industry leader and one of the world’s largest producer of fans, Lasko has another winner here. 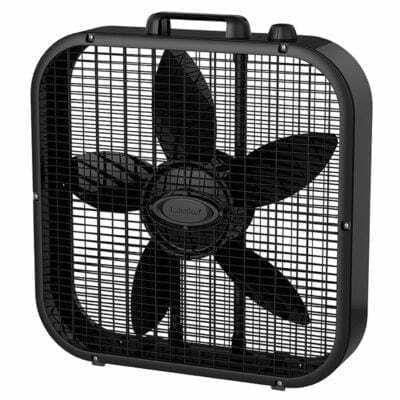 The B20401 Decor black box fan is an excellent choice in classic fan design and provides soothing white noise. The slim 20″ (50.8 cm) design delivers high volume air movement for great room cooling both in a window or floor. Controls are simple and easy to use thanks to the top-mounted 3-position knob. 3 quiet speeds provide a comforting and helpful white noise you’ll enjoy. Quiet enough to not disturb you, but loud enough to cover distracting outside sounds. The Save-Smart design means the B20401 delivers good peformance efficiently – less than $.02 per hour to run it! The fan itself features a rounded, safe design (no sharp corners) and a top-mounted carry handle for easy use. It also features Lasko’s patented Blue Plug safety fusing with electrical overload protection built right in. It’s a great sounding fan I’m confident you’ll enjoy using as much as I did. While not the absolute cheapest you’re paying just a few dollars more for better quality and reliability. If you’re looking for a well-made, classic, and reliable box fan for truly pleasant-sounding white noise, it’s an excellent choice. Not only that, but you’ll save money since it’s more energy efficient than other models. Take my advice and find out more now. You can read the excellent buyer reviews and feedback over at Amazon. 2. 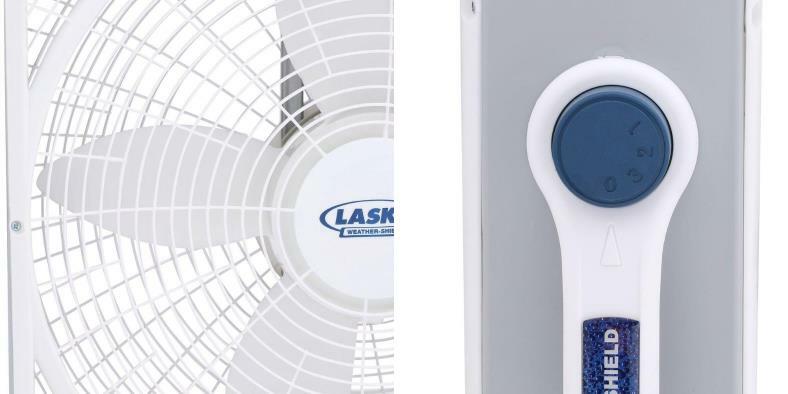 Lasko 3720 Weather Shield Performance – Worry-free white noise and window cooling. Leave it in and forget it! I absolutely love using box fans in my window. The cooling effect and fresh air I enjoy simply can’t be beat. However, when rain comes it’s a huge inconvenience to stop what I’m doing and take it out of the window every time. The Lasko Model 3270 Weather Shield Performance fan solves that problem as well as being a great performer that you don’t want to pass up. It also produces some of the best and smoothest white noise I’ve heard from a box fan. The Lasko Weather Shield #3720 looks great and works really well in windows…including yours. Classic style and operation mean hassle-free use. The design protects the electric motor in case of rain while in the window – no more having to pull a fan out and losing your wonderful fresh air and background fan noise! What’s unique about the Weather Shield is the design Lasko built in. In case of light rain, the motor is protected from exposure to water by a weather shield for worry-free operation. 3 quiet fan speeds provide excellent airflow and cooling. Despite being quiet enough to avoid distracting you, the 3720 still provides enough volume to block out troublesome and annoying sounds. t’s a wonderful and very calming fan I’ve enjoyed testing myself. (Left) The unique Wind Ring design on the grill helps focus air movement and increase performance by enhancing air speed. (Right) A great-looking and simple rotary control makes operation easy. The top-mounted carry handle lets you move the fan easily as well. Additionally, the front grill has a unique Wind Ring design which helps maximize fan performance by directing air movement for optimal air speed. It’s a cool design touch I haven’t seen in most competitor’s products. The top-mounted rotary control works well and in my opinion is a nice touch. It’s reliable and the “feel” is very good as well. No complaints about the handle – it’s easy to use and makes positioning the fan a breeze, too. It’s energy efficient thanks to the Save-Smart design. You can use it as much as you like for less than 2 cents per hour! Like other Lasko models, a fused safety plug is included in the power cord to prevent potential hazards due to electrical shorts or overloads. Rounding out all the wonderful features is a 2 year limited warranty. Overall, it’s one of the best box fans I’ve run across and a great buy. Likewise, it’s one of the best-rated by many happy buyers as well. Head over and see why it has received so many excellent reviews at Amazon. You’ll love it! 3. 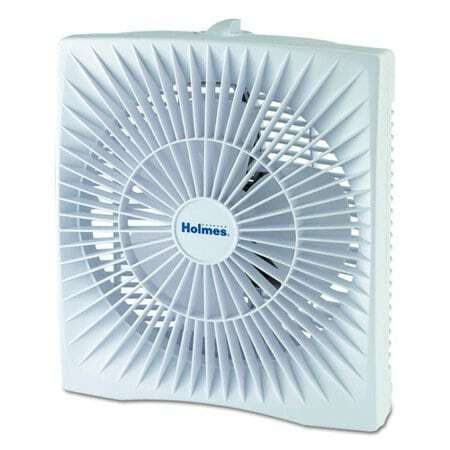 Holmes HABF120W 10″ Personal Size box fan – Compact and affordable white noise where you need it. Short on space or money? You’re in luck! The Holmes HABF120W Personal Size box fan brings compact value to anyone who doesn’t need a larger fan. It’s lightweight for very easy portability. The 10″ (25.4 cm) fan size provides comfortable cooling and white noise that’s great for your bedroom, RV, office, or nearly anywhere. 2 quiet speed settings give good airflow along with a moderate amount of white noise to help you focus on what’s important, be it work, sleeping, or just relaxing in peace. Its slim design means it can fit in more places (especially desk or night stand tops) where larger, bulkier fans can’t. A great way to get background noise & cooling without the noisy disruption of larger fans. Great for offices or college dorms! It’s also a great choice for kitchens for window sill use to bring in the refreshing night air. When it comes to small box fans, it’s one of the best you’ll find. It’s fantastic for small rooms or just taking with you where you need calming, comforting sound. Enjoy another great Holmes fan that really delivers. Have a look and see why it's a top seller with many very happy owners over at Amazon. Want a fan that’s got more? The Hurricane Classic Series 20 is a great choice. It’s a new take on the traditional box fan design. 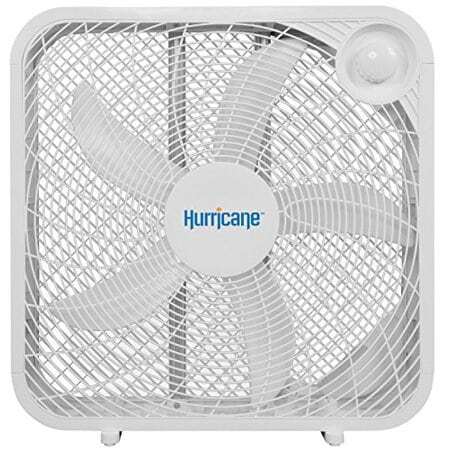 Hurricane produces a range of powerful but competitively priced fans of all kinds. They’re known for well-designed and reliable air quality products. (Left) The box fan includes a convenient cord storage area on the rear. 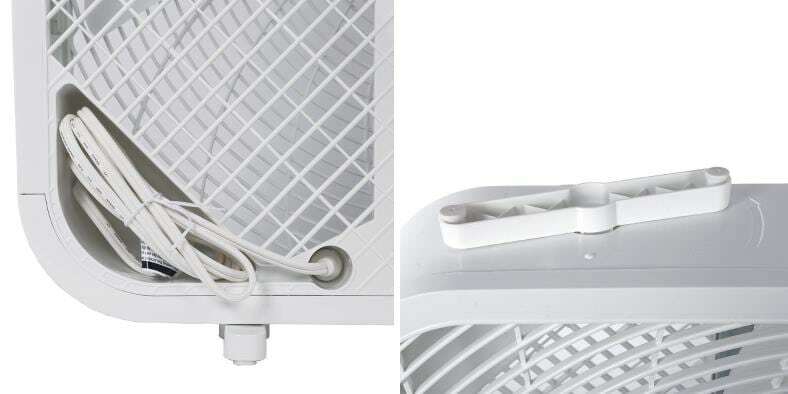 (Right) the fan’s bottom supports keep it steady and are easy to install. It’s a great, modern design you’ll really enjoy use. A front mounted 3-position dial makes it easy to set the fan to one of 3 speeds regardless of whether it’s used in a window or floor. The front grill helps better direct airflow outward for optimal cooling as needed in addition to producing a steady, soft white noise pattern. There’s also a safety fuse included in the power plug to protect against unsafe electrical conditions. It’s a unique design and a refreshing, affordable what to get white noise anywhere you need it. One drawback to be aware of is that there’s no carrying handle included like the other models I’ve mentioned. One cool advantage is that the base supports can be removed for easy window use. The top of the fan is free from obstructions that make it hard to close a window on. The Hurricane is a unique design in a world full of copycats. The front-mounted fan control and power cord storage set it apart and add convenience you can’t get with others. Additionally, due to its nice design the white noise it produces is really relaxing as well. Don’t miss out on this great choice! Head over and see why it reached #1 seller status and check out the great reviews at Amazon. Although the Lasko 3720 I listed above is a wonderful fan too, I’m confident in saying I’ve enjoyed the Lasko B20401 Decor box fan the most. Is it “fancy” or complicated? Not at all. But what it does it does very well. It’s a well-built, stylish, and solid easy-to-use box fan that sounds really good. After having the chance to get my hands on it I’ve award it the Editor’s Choice award. It’s a solid all-around value and one I’m sure you’ll love using too. Don’t hesitate to see the amazing buyer reviews over at Amazon that back up my own opinions as well. 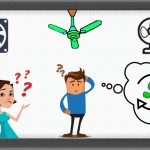 What if a box fan isn’t what you need? Guess what – there are some other great options as well! You can find the best white noise machines for snoring here. You’ll get great noise relief for just about any problem with one of them.